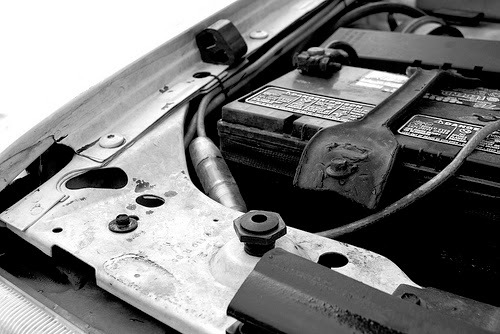 Car batteries can go years without giving you any trouble. But when they do start acting up, they can really be a pain in your backside and leave you stranded in inconvenient places. Here are a few simple tips to keep your battery clean and running mean for as long as possible. Start with a general cleaning of your battery. Clean the outside of your battery with a damp rag, feel free to use a mild detergent if you need more cleaning power. Clean the battery posts or terminals. First remove the battery cables (remove the black negative cable first, then the red positive cable). Next, use a mixture of baking soda and water to scrub away the corrosion with a battery brush or an old tooth brush. Check the battery for damage. If you see any cracks or bulges, it might be time to replace the battery. Reconnect the cables (positive cable first). You can also coat the terminals with a thin layer of grease to help prevent corrosion. Jiffy Lube of Indiana is also keen on keeping your battery clean. If you need help, just stop on by your nearest Jiffy Lube of Indiana. Our certified technicians will be more than happy to help.